Matt Feely (top) and Irvine Tejo. Photos courtesy of City of Mill Creek. By Joni Kirk, City of Mill Creek. 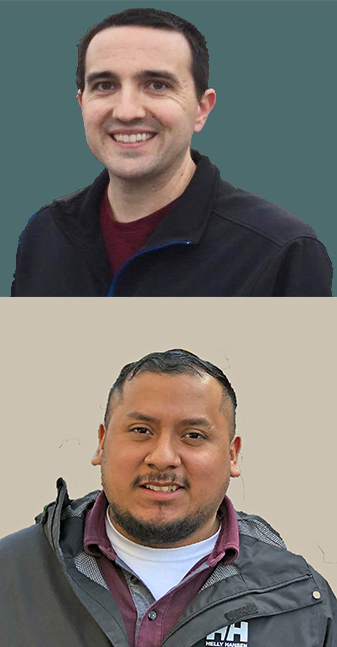 As the City of Mill Creek continues to grow, the Public Works and Development Services department added two engineers during March 2019 to assist with review, design, and construction of the city's roadway, traffic, and stormwater infrastructure systems. “With the arrival of Matt and Irving, the city is expanding its capacity of project delivery,” said Gina Hortillosa, director of Public Works and Development Services. Supervising Engineer Matt Feeley holds a civil engineering degree from California State Polytechnic University-Pomona and has worked in both California and Washington State. He spent the past five years with Snohomish County Public Works, where he was a member of the Transportation Program Planning and Engineering Services groups. Feeley will focus on Capital Improvement Plan projects for Mill Creek, such as Exploration Park and Seattle Hill Road pavement preservation work. In his free time, he enjoys hiking and snowboarding. Project Engineer Irving Trejo also joins the city from Snohomish County Public Works. He previously worked for the City of Colfax, Wash. He received his civil engineering degree from Washington State University. Tejo’s immediate work for Mill Creek will focus on facilities projects that are in the Capital Improvement Plan, as well as Heron Park. His favorite activities away from work include cooking, playing soccer, building LEGO sets and watching college football (Go, Cougs! ).